Rows of solid wood shelving and cabinet doors shining with a unique grain pattern help define the Amish Jacob Martin 3-Door Hutch. 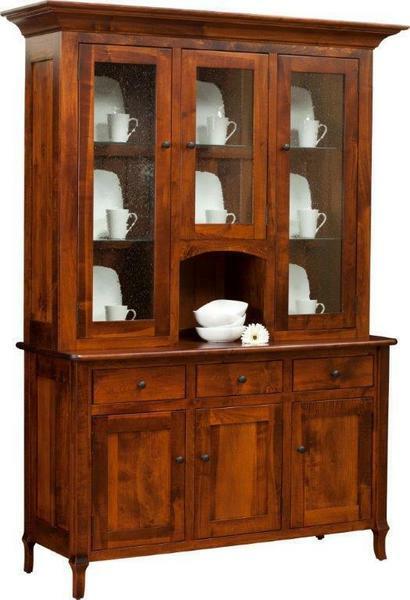 This solid wood hutch is sure to catch the eye of family and friends as they pass through the dining room or share a meal at the table with you. Solid wood hutches offer exciting storage options and can be used just the way you want. Store serving pieces, fine china, cloth napkins, silverware, books, candles, a collection of home bar glasses or anything you'd like. The Jacob Martin 3-Door Hutch is shown here in brown maple wood. Investing in a new wood hutch is an exciting event--especially when you can customize it exactly the way you want it and we can't wait to help you do so! Amish Furniture Specialists are available to advise you on wood types and finish colors. Just email or call at your convenience. We also offer our How to Design Your New Hutch or Buffet in 7 Simple Steps video as a handy guide. Amish Furniture Specialists can be reached by email at Questions@DutchCrafters.com or Toll-Free at 866-272-6773. Thank you for shopping with us.